Inspired by the Russian beef stroganoff, this soup is one of my favourite stews I would always eat with noodles. I wanted to make sure my vegetarian and non-vegan friends alike who don’t take beef would be able to enjoy this wonderful soup, hence the chunky vegetarian version! 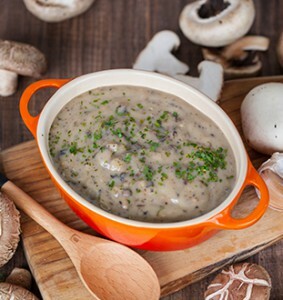 Thick and chunky in texture, the blended mushrooms with herbs is a mushroom-lover’s dream come true. Vegetable stock (water, root vegetables, herbs), button mushrooms, shiitake mushrooms, cream, corn starch, grape must extract,onions, butter, vegetable oil, herbs, salt, sugar and garlic.